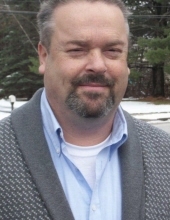 Scott Morrow, 54, of Schwenksville, PA, passed away unexpectedly on January 17, 2019. Scott was born in Wheeling, WV on October 27, 1964 to the late Fred and Dolores (Gable) Morrow. He was a proud Navy Veteran who adopted Pennsylvania as his home. Scott, known as The Fearless Ghosthunter, created a radio show of the same name that was broadcast on ParaMania Radio for many years. He was an avid supporter and organizer of HauntCon, a trade show for people in the Halloween industry. Scott was a ready and sympathetic friend to all who knew him and he was eager to help others in every way that he could. To say he was a devoted and caring father would be a huge understatement. His daughter and son were his everything. He is survived by his two children: Kayla and Jason Morrow; his former wife: Julia Solo; his loving companion: Susan McManus; and his sister: Mindy Morrow. He was predeceased by a brother: Fred Morrow. Relatives and friends are invited to his Funeral Service on Thursday, January 24, 2019 at 12 PM at the Emil J. Ciavarelli Family Funeral Home and Crematory, 951 E. Butler Pike, Ambler, PA 19002. A viewing will be from 10 am to 12 pm. Interment will be in Rose Hill Cemetery, Ambler, PA. In lieu of flowers, donations in Scott’s name may be made to Scott Morrow Children’s Fund C/O Emil J. Ciavarelli Family Funeral Home, 951 E. Butler Pike, Ambler, PA 19002. To send flowers or a remembrance gift to the family of Scott Morrow, please visit our Tribute Store. "Email Address" would like to share the life celebration of Scott Morrow. Click on the "link" to go to share a favorite memory or leave a condolence message for the family.